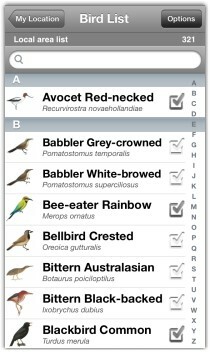 The Pizzey and Knight Birds of Australia Digital Edition for iOS is a comprehensive and interactive application that combines multimedia data on over 900 Australian bird species with seven interactive modules for every aspect of mobile birding. As a universal app it runs on iPad, iPhone and iPod. 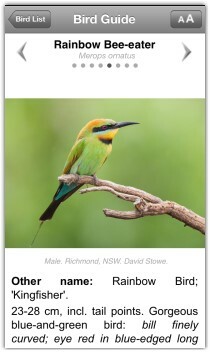 The Field Guide is new for iOS apps, displaying the full field guide pages of the book. 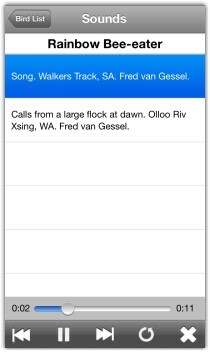 You can browse the pages and identify a bird, play the sound, add to your list, and open the Bird Page for further detail. 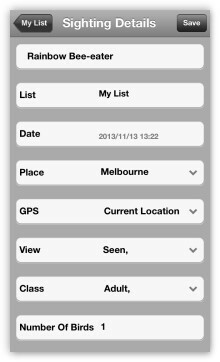 My Lists is a personal list manager that includes a life list and sub-lists that report to your life list. 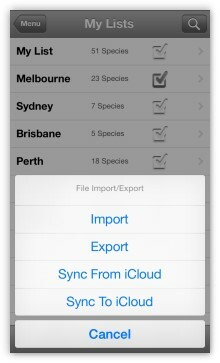 You can also sync your lists to iCloud, and export and import lists using iTunes. 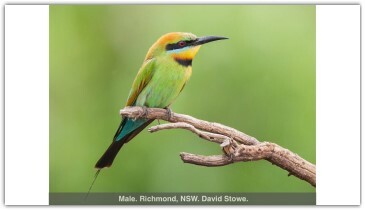 Birding Sites includes details of 250 birding sites from around Australia, with functions for a bird list, ‘show on map’ and a seven-day weather forecast. As a universal app it will run on iPad, iPhone and iPod, and you can install to more than one device as long as it is your personal device and linked to your iTunes account. The price is AU$49.99. 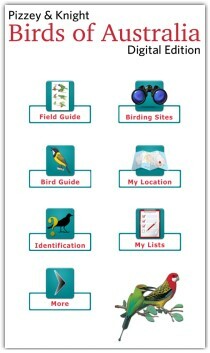 The Field Guide displays the field guide pages of the book, providing quick and easy access to a bird or family group for instant comparison and identification. 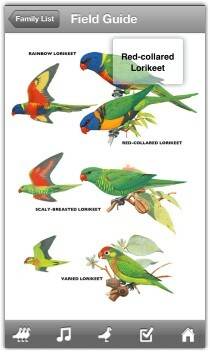 The Bird Guide includes a full bird list and bird pages for over 900 species. 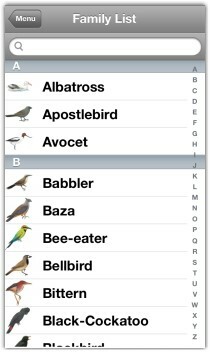 Tapping on a bird name will open the functions toolbar. Tapping a second time will open the bird page. 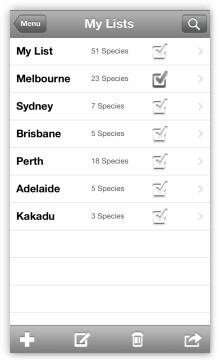 Bird List Options include lists for all states and territories, english names for C&B, IOC, Clements and Birdlife, and alphabetical or taxonomic order. 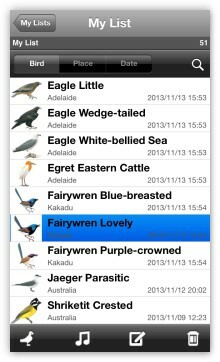 The name of the list and number of birds is reported above the list. 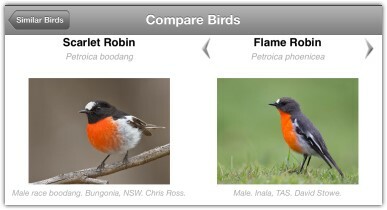 The bird page is highly functional yet easy to use. 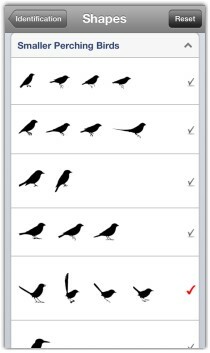 Swipe right to left to scroll through the images, swipe up to scroll through the text, tap the bird image to load the function toolbar, or tap the arrows at the top of the screen to page to the next bird. The images include illustrations, distribution map and photos. 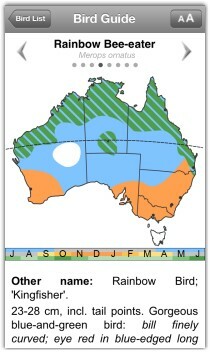 The distribution maps are colour-coded green for resident, orange for breeding migrant, and blue for non-breeding migrant. The screen can also be rotated for a larger image. 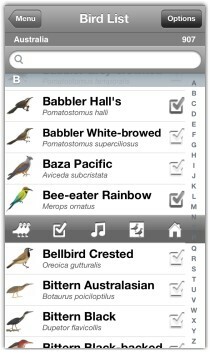 Similar birds loads a pre-selected list of birds similar to your selected species. 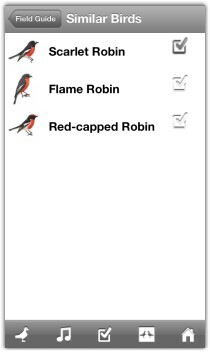 The Identification Module can also be used to generate a list for Similar Birds. 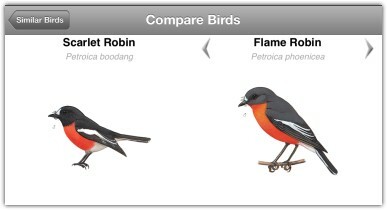 Tap the COMPARE button and the bird pages are shown in a split screen, with full swiping and scrolling functions of the bird page. Tap the bird image to play the sound. 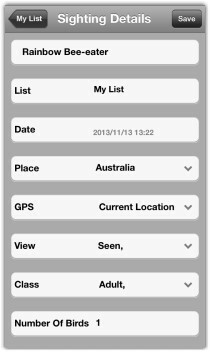 My Location is a powerful tool for finding your current location, generating a bird list for your location, viewing nearby birding sites, and recording GPS co-ordinates with your bird list. 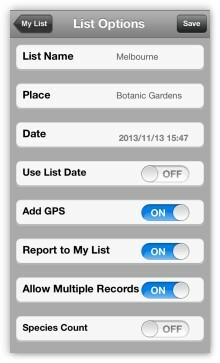 [Get List] on the nav bar will generate a bird list for your selected location. 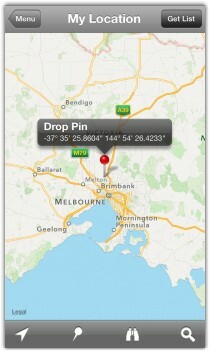 The module uses Apple Maps and built-in GPS functionality to find your current location, or you can drop a pin for a new location. 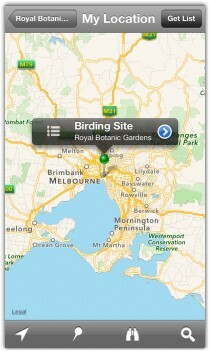 Birding site descriptions and bird lists can be loaded directly from the map. This generates a shortlist for you to make an identification. 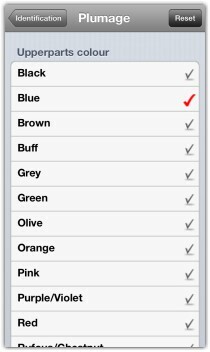 One need not use all the available selections, and if you are not sure, you may pick a number of options within any group. 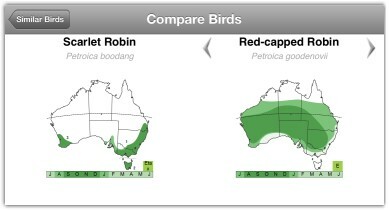 To further aid identification, open Similar Birds with the ID shortlist. 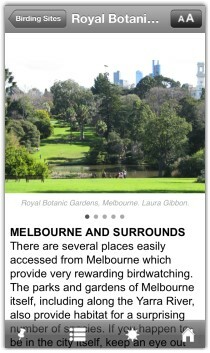 The Birding Site module includes 250 birding sites from around Australia and island territories. 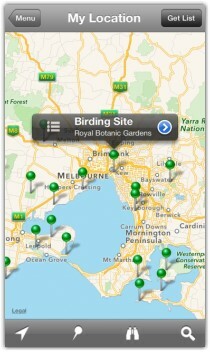 The sites can be viewed by selecting from the list, or by using My Location to load the map with nearby birding sites. 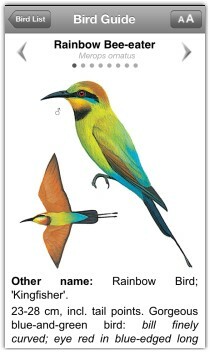 You can add a bird to My List from any bird List, Field Guide page or Bird Page. 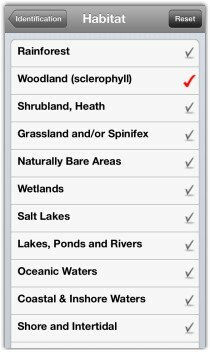 When adding from a bird list, you can “Add Directly” or via “Add/Edit with Sighting Details”. 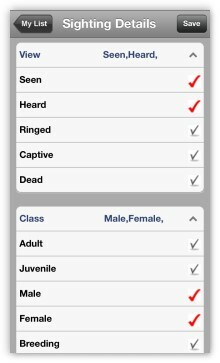 To "Add Directly" you simply tap the tick-box next to the bird name on the bird list. 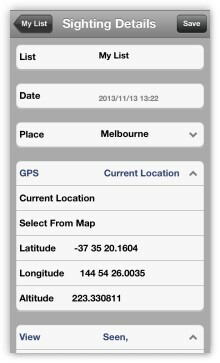 This uses the default place and date settings for the list, and your GPS location. “Add/Edit with Sighting Details” is available on the toolbar, and opens the Sighting Details page for additional details and notes. Sighting Details include the List Name, Date, Place, GPS data, View, Class of bird, No. of Birds, and your Notes. 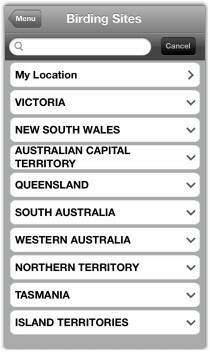 A different List and Date can be selected, Place data can be edited and previous entries are available as a drop-down, and View and Class fields support multiple selections. The GPS data recorded includes the latitude, longitude and altitude of the sighting. 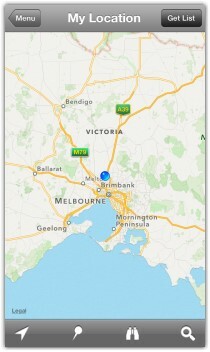 You can select the "Current Location" or use "Select from Map" for another location. Use List Date. 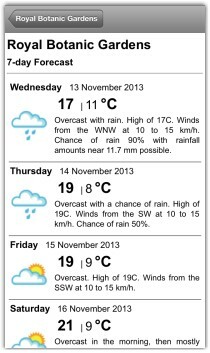 If OFF, you get the current date and time. 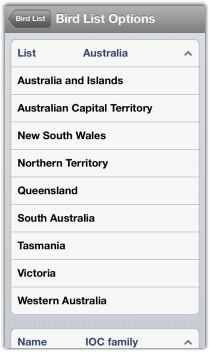 ON is used for creating an historical list. Allow Multiple Records. ON allows adding the same bird more than once to a list. 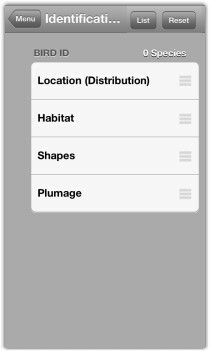 Used for keeping a trip list of all birds seen at different times and locations. If you are keeping a strict Life List, leave OFF on My List. 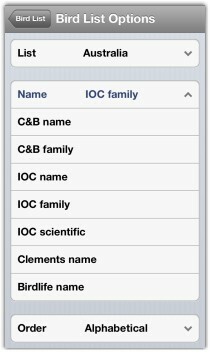 Your lists can be synced to and from iCloud. 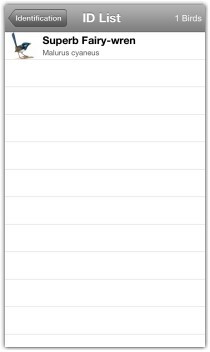 This is useful for backup and for sharing lists between devices. 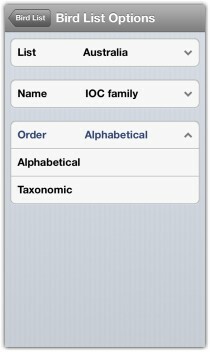 Lists can also be exported to iTunes for personal use. Your iPhone must be connected to your PC to do this. 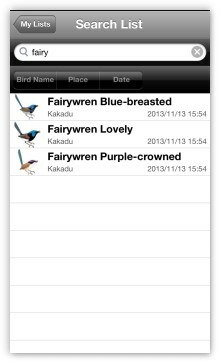 The exported lists are My Lists.csv and PKBirds.sqlite. My Lists.csv is a user-friendly export for your personal use. It cannot be re-imported to the app. PKBirds.sqlite is a program format file that is used for exporting and importing backup files. It can be edited, but requires a freeware SQlite program to do so.